That America is being overwhelmed by a flood of immigrants has become conventional wisdom for some. Remarking on undocumented immigration and border security President Trump claimed last November that, among many other negatives, “Illegal immigration hurts American workers; burdens American taxpayers; and undermines public safety.” Many immigration experts and analysts, including Shikha Dalmia, a senior analyst at Reason Foundation, argue however that the idea that America is experiencing mass immigration is a myth. Escher X nendo | Between Two Worlds is a visually stunning exhibition at the National Gallery of Victoria (known as NGV) in Melbourne featuring over 150 preparatory sketches, drawings, woodcuts, mezzotints, and lithographs of famed Dutch artist M. C. Escher along with work by the internationally-acclaimed Japanese design studio nendo. The pairing is appropriate since both Escher and Oki Sato, nendo’s founder and principal designer, “share common interests in their love of spatial manipulation, optical illusions and playful visual devices.” In this exhibit, which I thoroughly enjoyed, Sato and his design house nendo have created an immersive installation where visitors can experience Escher’s brilliant 2D graphic world along with nendo’s inventive 3D design world. Sato chose the house shape as a motif for the exhibition because he wanted to create “a house for Escher.” The house motif is repeated in various formats in the exhibition rooms and playfully interspersed with Escher’s own works. In the exhibition’s largest room (the above photo), a grid of black-and-white houses with both open and closed roofs act as a maze that forces visitors to walk through the space to discover tabletop light-boxes displaying works by Escher. Sato says: "I sort of feel like I became best friends with Escher, even though I never met him.” Visitors to the exhibit might feel the same. 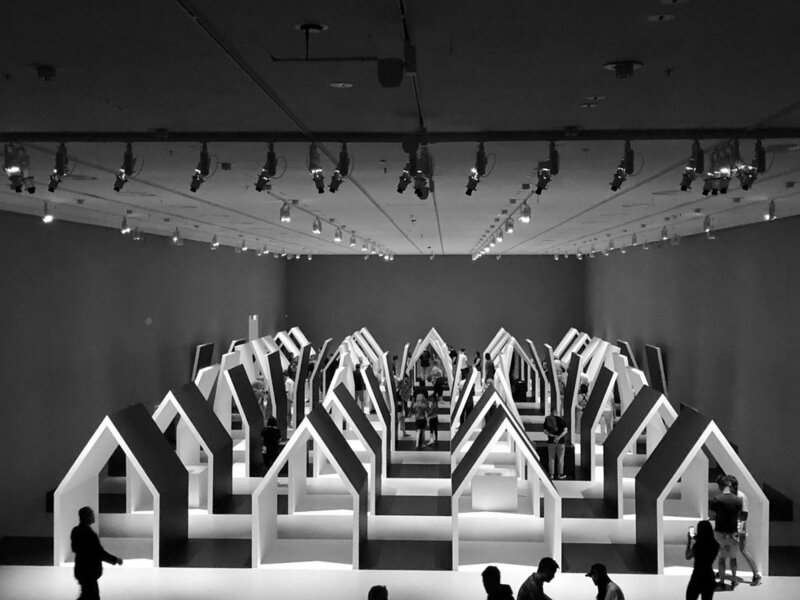 Escher X nendo is on display at the NGV International through April 7, 2019. Last week President Trump addressed the nation in a speech about immigration and what he has claimed is a “crisis” at the US-Mexico border. Throughout the course of his nine-minute speech (which was made on the 18th day of the government shutdown), numerous fact-checkers and experts agree that the president painted an exaggerated and overall misleading picture of immigration to the US and the situation at the US-Mexico border. Fact-checkers across mediums confirm that the President’s speech pumped up some numbers, exaggerated the public safety risks of immigration, and repeated false claims regarding funding for the border wall. Poetry Jukebox in Ruth E. Wittenberg Triangle in Manhattan. There is no such thing as a “freelance” work visa in the United States. With very few exceptions, nearly every work visa in the US must be sponsored by a legal and operating US company or agency. The Washington Post: "Shutdown worsens strain on US immigration system"
The ongoing partial US government shutdown is causing a further strain on US immigration courts as well as creating potential hardships for US Border Patrol agents, Immigration and Customs Enforcement (ICE) officers, and other front-line Department of Homeland Security who are considered “essential” workers and must continue to work without pay during the shutdown. Tony Reardon, president of the National Treasury Employees Union, says that the federal employees including CBP officers and agriculture inspectors stationed at border crossings and airports are “key to our nation’s security and economic success, and they do not deserve to be treated this way.” CBP agents are taking into custody more than 2,000 migrants per day on average and, with nowhere to detain them, the governments has been releasing hundreds onto the streets in El Paso, Texas, Yuma, Arizona, and other border cities. We are sorry to say goodbye to Alla, a paralegal at DLG. She will be going on some adventures abroad and afterwards moving out of New York City. Alla brought a wonderful background and experience to the firm, and she will be missed. To say goodbye, we had some wine and cheese and watched the sunset together. (Maybe a few tears were shed.) We wish her all the best on her travels and hope she stops by for visits in the future where we can watch even more sunsets (you know, since we have such a good view!) Bye, Alla!